Jake Duffy (left) opened the scoring for Stamford AFC against Northwich. AFC Stamford soared up three places in Division One South of the Evo Stik Northern Premier League with a 4-0 home win over bottom club Northwich Victoria last night (March 21). Jake Duffy opened the scoring for the Daniels after 16 minutes and Elliot Sandy made it 2-0 10 minutes later. 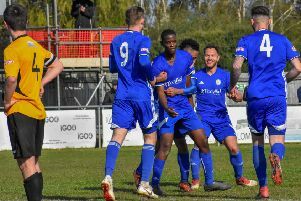 Delroy Gordon and Grant Ryan pounced for goals in the second half as Stamford recovered from a 5-0 home drubbing at the weekend to move up to 12th place. Billy Smith (right) scored for Wisbech at Eynesbury. The formbook was turned upside down in the United Counties Premier Division as a five-game winning streak for Wisbech Town came to an end at Eynesbury, a team that hadn’t won in their previous five matches. The Fenmen were always playing catch-up after conceding two early goals. Billy Smith and Sam Murphy were the scorers for Wisbech who remain seventh. There’s a Daniels Cup tie between UCL Division One side Blackstones and Peterborough League Division One side Wittering Harriers, and an Ancaster Cup tie between Peterborough Premier Division rivals Deeping Rangers Reserves and Stamford Lions tonight (March 22). AFC Stamford 4 (Duffy, Sandy, Gordon, Ryan), Northwich Victoria 0. Eynesbury 3, Wisbech 2 (Smith, Murphy).